The weather has been so gorgeous lately that I can’t help but want to be outside enjoying every waking moment! Although, now that we’re well into spring, we can expect wind gusts, funnel clouds, and occasional downpours without warning. If you happen to get caught in one of these common elements, turn to glam hair accessories to distract from the close call bad-hair-day ‘do! And even if you know you’re staying dry, try out some hair jewels for fun. Bobby pins aren’t just for holding up stray hairs. 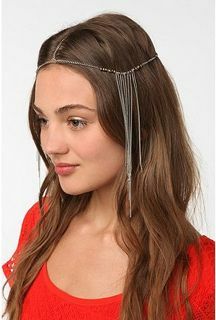 Use detailed ones, like these from Urban Outfitters, as decoration for your locks, pulling up an asymmetrical side style. These are great for short crops as well! 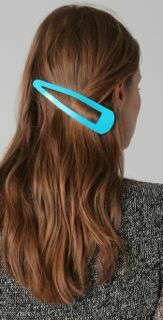 I just love this ’80’s neon throwback snap clip from Shopbop! Use it for a half-up twisted style or a bright addition to a loose pony tail. 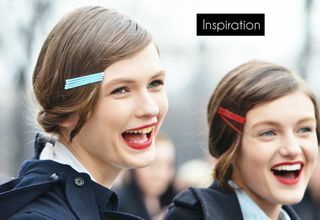 Stack brightly colored bobby pins together in a cluster to create a barrette look. I just love these spring hues for a pop of color near the eyes. A great option for this look are the Scunci bobby pins at Target (pictured above right). This twist on the regular headband is a must-have for hot summer days. Pull it over loose beachy waves or a bob. Feeling too warm? Slide the turban further from your forehead with a messy bun. This one from Forever 21 is pretty cute. 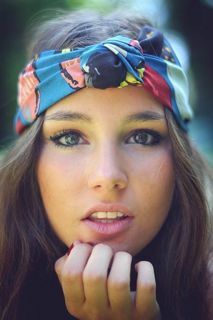 For the days you would like to forgo the earrings and necklace, enter the chain headwrap! This jewelry piece from Urban Outfitters is so boho chic and ’70’s reminiscent, perfectly paired with a flowy maxi dress and air-dried hair.